Donald and Melania Trump are on the third and final leg of their first presidential overseas trip. Trump first went to Saudi Arabia, then to Israel and is now in Vatican City, meeting with Pope Francis. The Trumps arrived in Rome Tuesday night and while the details of what happens during the visit are yet to be determined, all eyes were on Melania for her stellar and modest style. Melania met Pope Francis Wednesday morning alongside her husband, as well as Ivanka Trump and Jared Kushner. 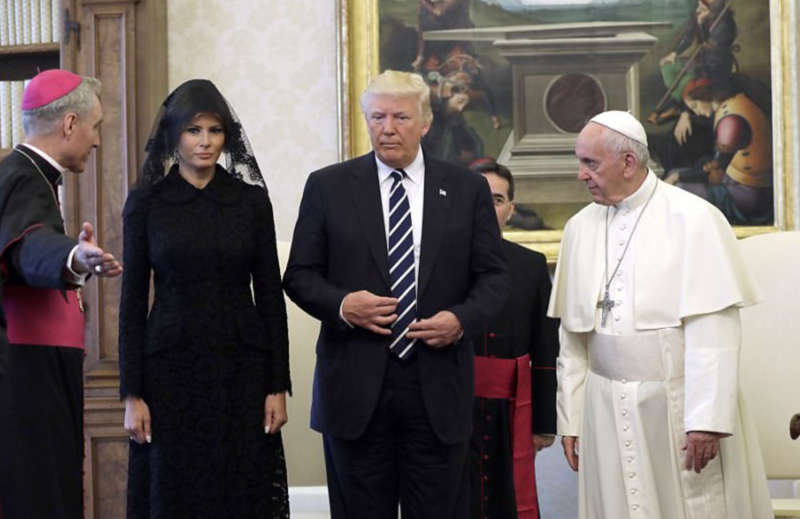 Both women honored the traditional Vatican dress code, which calls for black, long-sleeved dresses and veils. Melania took it a step further, wearing Italian designed Dolce and Gabbana as a nod to her time in Italy. It was a surprising move, considering that both Melania and Ivanka decided to forgo the traditional headscarves worn by women while in Saudi Arabia. While it is required for Saudi women to wear them, no such requirement is in place for foreign visitors, although it is not unusual for female foreign leaders to cover their heads anyway, as a sign of respect. Still, both Ivanka and Melania dressed modestly while they were in Saudi Arabia, although they didn’t skimp on their signature glamorous style. But when Ivanka visited the Western Wall while in Jerusalem, she did choose to cover her head, as is custom for Jewish women. Ivanka converted to Judaism in 2009 for her husband, Jared Kushner. Pope Francis is said to be interested in relaxing dress code guidelines for private audiences with the Pope, which were in place for his predecessor, Pope Benedict XVI, and previous popes. Women were required to wear black, long-sleeved dresses with a lace mantilla, unless they were royalty from a handful of Catholic nations who were eligible for the “privilege of the white” rule. Princess Charlene of Monaco exercised that privilege, for example, wearing a white crepe jacket and white gloves for her visit with the Pope. But while the rules have been relaxed over recent years, it is common for visiting heads of state to still abide by them, as a way of showing respect. Melania’s outfit for her papal audience has received applause, as she managed to not only look reverent and appropriate for the occasion, but stylish and glamorous as well. It’s obvious that keeping with tradition can pay off.